Has larger solar panel for overcast weather or faster recharge. 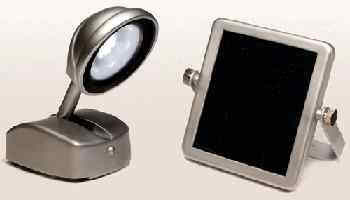 Powerful 1/2 amp solar panel plugs into lamp base. 8 LED Lamp is about 6” high, 3” in diameter. Nickel-metal hydride battery. Solar panel is 5-1/4” x 9-3/4” x 5/8” with mounting bracket, 15’ cord, DC plug.